In Ashley Bryan’s Beautiful Blackbird, a group of colorful African songbirds love and praise the titular creature who they deem the prettiest among them. All of the birds love blackbird so much, in fact, that they want to have black markings on their own feathers just like he does. Blackbird tries to let his feathered brethren know that altering the outside appearance doesn’t change what is within, but all of the birds beg Blackbird for black markings, and so he complies by making paint in his gourd and applying the brush himself. At the conclusion of the story, all of the newly black specked and spotted birds affirm that yes, black is indeed beautiful. The songlike rhyme and chanting textual portions, when coupled with the strikingly colorful illustrations, give the reader a glimpse into the culture of the Ila-speaking people from the African country of Zambia. Children will find this pour quoi tale easy to listen to, especially if the storyteller reads it in a chant-like manner placing emphasis on the rhymes throughout. Whatever confusion may be created in the message is certainly made up for in the lively illustrations. Children will be drawn to the simplicity of the cut-out shapes of the birds and the array of colors used. As Booklist states, “Bryan employs boldly colored, cut-paper artwork to dramatize the action. The overlapping collage images fill the pages with energy.” The author’s note at the end of the book explains that the scissors pictured in the endpapers used to create the colorful illustrations actually belonged to his mother. A paper craft would be a great addition to a library storytime or literacy event. 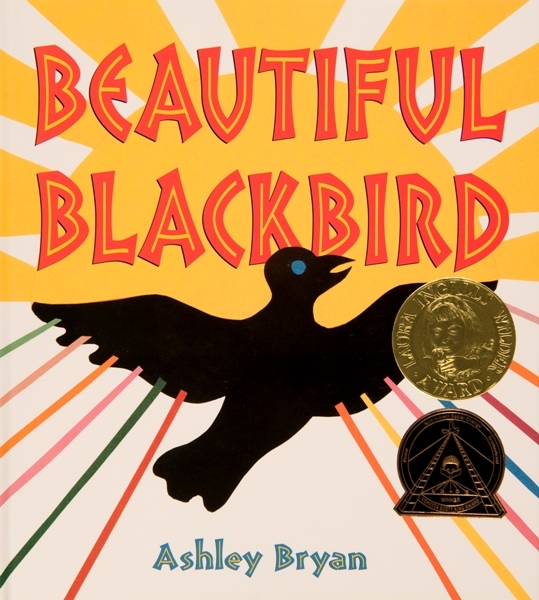 After reading Beautiful Blackbird, a librarian could take the time to have children really focus on Bryan’s illustrations and brainstorm ways in which they believe them to be constructed. The librarian could then share Bryan’s story of how the illustrations were created and set children loose with paper and scissors to see what kind of creative works of art they could come up with. Beautiful Blackbird was the recipient of the 2004 Coretta Scott King Award and was nominated for a Bluegrass Award in 2005. Additionally, it has received many positive reviews from reputable publishing companies. Books in Print. Texas Woman’s University Library. Accessed September 22, 2013.